I can recall that I met Alhaji Shehu Shagari in Paris, in 1967, through a chance meeting where the late Abdulmalik asked me, if I know Alhaji Shehu Shagari and I told him that I know him on the pages of the newspapers, but never meet him one on one. Abdulmalik said he will want both of us to work together, so that I can understudy him. From the first day we started working together, I always see him with responsible people. We spent four days working together and after some time, Abdulmalik asked me, how do you find Alhaji Shehu Shagari? And I said, “he is a gentleman, cultured, civilised cultivated, humbled with high degree of humility.” I said he is a Prime Minister material, I swear to Almighty Allah that was the statement that came out of my mouth. Prior to our meeting, I was faced with two scholarship options of either going to New York State University to read journalism for five years at degree levels or go to Germany to read diploma in Journalism for two years. I opted to go to Germany to read diploma in journalism for two years, because as at that time I can speak elementary basic Russian Language, so I was interested in foreign language. That is why I was the first African to read journalism in Western Germany in Hannover, from 1964 to 1966. I was the one that broke the news of the January 15, 1966 coup to the Nigeria Consulate-General in Germany and the Prime Minister, Abubakar Tafawa Balewa, whereabout is unknown, until the BBC confirmed his death. Unfortunately, we have deviated from the monolithic North late Ahmadu Bello bequeathed to us. He told us that be you a Kanuri, a Fulani, a Birom, be you a Tiv, a Nupe, we are Northerners. He told us, be you a Muslim, be you a Christian, be you a Pagan, you are a Northerner. Abdulmalik told me that they, the leaders, were grooming four people, to succeed them, the late Usman Seriki who became the Etsu Nupe, he was then the Minister of Internal Affairs, Alhaji Shehu Shagari, who became Minister of Establishment and was a Permanent Secretary to Sir Abubakar Tafawa Balewa, the late Maitama Sule and late Ibrahim Waziri. Those were the four people they were grooming, but they saw it more on President Shehu Shagari. So, he was shocked the way I say he is a Prime Minister material because, at that time, we were under parliamentary system of government. It was eported that a delegate you led from Plateau nominated Shehu Shagari in Kaduna zonal convention of the NPN as party’s presidential aspirant. What prompted the nomination? Yes. The report was correct. But let me tell you this that he was not aware of the plan to nominate him as NPN presidential candidate until we gathered for the zonal convention at the Murtala Square, in Kaduna. He came in as a senatorial candidate from Sokoto State, which has no candidate for president. The only person who knows the secret with me was Umaru Dikko and I had warned him not to divulge the plan to anyone. At the convention, Kano has three aspirants, Maitama Sule, Inuwa Wada and Dr Datti Ahmed. Borno has Adamu Ciroma, Gongola brought Professor Iya Abubakar, Bauchi brought Ibrahim Dahiru, Benue nominated JS Tarka and Kwara brought Dr Olusola Saraki. Because I was the head of delegation from Plateau, few minutes before we left for the convention ground, I ask them a favour, that I will like us to nominate Alhaji Shehu Shagari, they unanimously endorsed my request as the leader of the delegation. My sudden nomination of Alhaji Shehu Shagari as leader of Plateau delegates, though caught many by surprise, but the support was spontaneous. After the ballot, Alhaji Shehu Shagari has 26 votes, Adamu Ciroma has 24, because he was the candidates of the military, Professor Iya Abubakar and Dr Olusola Saraki were tied on 19 votes. Maitama Sule, 18 votes, JS Tarka had 17 votes. Inuwa Wada had three votes, while Dr Datti Ahmed and Ibrahim Dahiru scored one vote each. After the Kaduna convention, we decided to present six of the candidates before the national convention in Lagos. At the end, Shagari emerged overwhelmingly, ahead of Maitama Sule, Adamu Ciroma, Saraki, JS Tarka and Professor Iya Abubakar. From NPN presidential flag-bearer till he became Nigeria’s President, winning re-election, are all in the public domain. It was also said that your group worked against some northern politician and enthroned Chief Adisa Akinloye to become the national chairman of NPN? Yes. Three people approached me with their aspiration to become NPN national chairman . One of them, Adisa Akinloye, my preferred choice eventually emerged. When Akinloye met me, I advised him to go and negotiate with the Kano delegates to get their votes. I promised to deliver Plateau, split, Niger and North Central. The second person who approached me was Chief Fani-Kayode, who was my leader when he was the deputy premier because I was enable to liaise between Akintola with the NNPC group. Fani-Kayode was my political boss, he was the chairman of my wedding, but when he discussed his aspiration with me, I told him to his face that I will not support him because I knew his personality and Alhaji Shehu Shagari can never work together. Shagari is a peaceful man, while Fani-Kayode is a controversial person. The third person was General Adebayo, I also told him point blank, I will not support him, because we are not going to bring a military man to be a chairman of our party. The election came for the national chairman, and Adisa Akinloye emerged the winner. Even though I know he is very crafty, but he can work peacefully with Shehu Shagari. 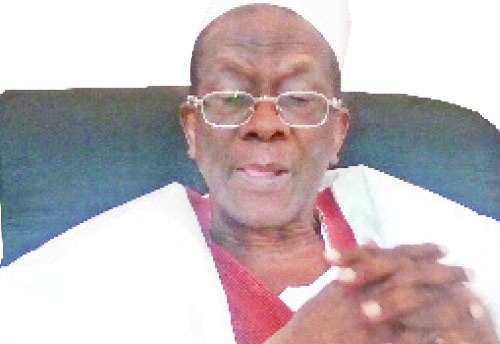 Shagari was a true associate, his life was embodiment of truth to celebrate. If we learn lessons from his habits of forgiveness and tolerance, Nigeria will be a good country. A distinct habit of the late former president, which only those who interacted with him will tell that he was a very simple and humble man in spite of the various positions he held. He was a man who possessed a very clean and good heart which he showed clearly in his life time through various engagements and activities.